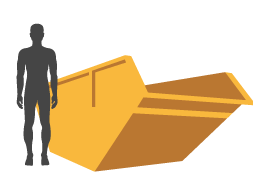 Our small skips are large enough to hold up to 40 refuse bags, but still compact enough to sit on your property or a nearby verge, subject to a skip permit. Aasvogel’s small skip hire solutions are best suited for small household clearances and are readily available for hire. A 4 yard open small skip is perfect for small renovation jobs, such as kitchen or bathroom refits. It sits comfortably on a driveway, taking up no more room than a standard car – making our small skips manageable. A 4 yard small skip from Aasvogel takes approximately 40 bags of waste – almost double the capacity of our mini skips. The exact measurements for our small skip are: 6 feet (2.6m ) long, 4.3 feet (1.29m ) wide. 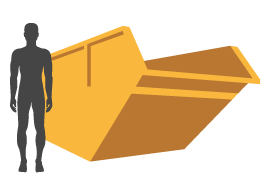 As an open top skip, there’s no strict height restriction – but the waste should be safely reasonably close to the edges and not overfull. What is a Small Skip? Our small skip is more compact than a standard skip, at a quarter of the size. It’s perfect for smaller waste jobs, like home renovations, garden clearances or just a good old fashioned clean out. The 4 yard small skip from Aasvogel has a capacity of 3 square metres, or around 40 bin bags of waste. When Might You Need to Hire a Small Skip? If you’re looking to remove a large load of waste, you could take a van to the tip – but that’s not always a convenient solution, or the best one for your needs. Our small skips are perfect for longer-running jobs – like home renovations or landscaping. It’s a great choice for small construction excavations too, with enough room to handle quantities soil and rubble. Do I Need a Permit to Hire a Small Skip? If you’re planning to keep the skip on your own driveway or in your garden you don’t need a permit. If you’re storing it on the road or in any public location, you will need a permit for the skip, and may have to adhere to additional rules. These rules differ from council to council. Here at Aasvogel, we’ve got this covered for you – we handle all the administration, including skip hire permits, on your behalf. We have over 20 years of waste management and skip hire experience here at Aasvogel. We like to think we know everything there is to know about recycling, repurposing and safe removal of waste. We’re proud of our experience – and even prouder of our excellent customer service! We’re here to make the process of hiring a skip as easy as possible. Our knowledgeable team can help with any questions you may have, plus we handle all of the administration – including permits. So all you have to do is tell us where and when you want your skip, fill it up and let us know when to pick it up again! We’re committed to reducing waste landfill and are happy to announce that we recycle 94% of the waste we receive. We’re aiming to make the world a safer and cleaner place for everybody – starting with the waste. We’re happy to offer a competitive price on your small skip hire needs. If you wish to know more or would like a no-obligation quote, give us a call on 01235 760555 or use our online quote form at the top of this page.